Want to receive email updates for new hydrology reports? 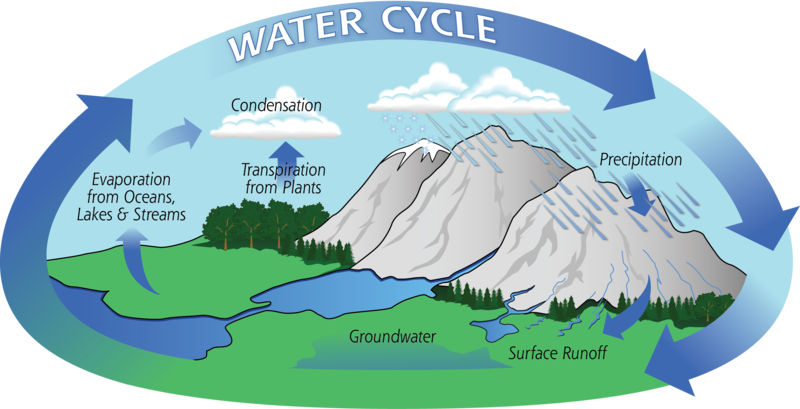 Hydrology refers to the study of water and how it impacts the environment. Precipitation, groundwater, runoff, lakes, and streams: all of these seemingly individual components interact with one another to form a dynamic system known as the hydrologic or water cycle. Understanding these interactions as well as how each of these aspects can affect things like the local ecology and lake water quality is one of the key management strategies of the City’s Natural Resources Division. The following sections provide some background information on some of the key parameters monitored by the City as well as a brief report of current hydrologic conditions, updated monthly. When water from the atmosphere makes its way to the Earth in various forms (e.g. rain, snow, sleet, hail), it is referred to as precipitation. Locally, the predominant form we see is rainfall. Due to its geographic location at the top of a ridge, Winter Haven is a purely rainfall driven hydrologic system—meaning that the source of all surface and groundwater is derived from rain as opposed to water flow from upstream. In fact, Winter Haven’s lakes act as part of the headwaters for the Peace River which flows to the Gulf of Mexico via Charlotte Harbor. The implication of being completely rainfall driven is that the amount of water in our aquifers and lakes is directly related to how much rain we receive. Also known as lake stage, surface level represents the height above sea level of a lake’s surface and is an incredibly important metric to keep track of. 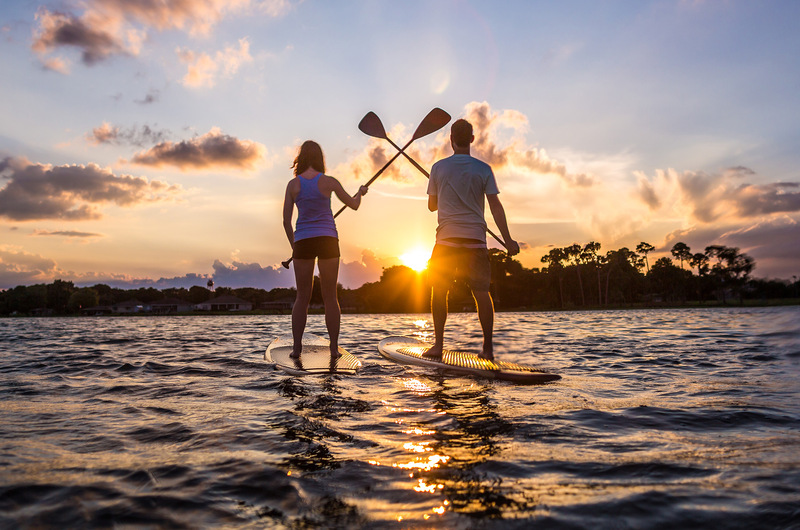 As the Chain of Lakes City, Winter Haven prides itself on its numerous waterbodies which serve as integral social, economic, and ecological resources for the community. When the level of a lake fluctuates it can impact things like navigation through canals, the ability for residents to use docks and boat ramps, and wetland connectivity—which can also affect water quality. Rainfall and groundwater conditions play an enormous role in lake stage fluctuations. Lake levels are typically replenished during Florida’s “wet” season (May – September) and will decline during the “dry” season (October – April). With roughly 50 lakes in the Winter Haven area, monitoring the level of each would prove challenging. However, the 14 connected lakes of the Southern Chain are generally considered to be representative of all the lakes in the region. Partnering with the Lakes Region Lakes Management District, the City compiles daily staff gauge readings for the Southern Chain to track fluctuations and compare with historic levels. Installing level sensors on more lakes is one of the Natural Resources Division’s main management goals for the future. There are two major types of groundwater with respect to Floridian geology: the water table and the confined aquifer. Also known as the surficial aquifer, the water table is the level of water trapped in porous space in the ground directly beneath the surface. Whereas, the confined aquifer is much deeper and is typically separated from the surficial aquifer by an impenetrable confining layer—such as clay. The level of the water table generally fluctuates rapidly and is tied closely with atmospheric conditions such as temperature, humidity, and rainfall. The confined aquifer, on the other hand, can only exchange water with the surface through breaks in the confining layer—meaning that its level is much more stable. Both types of groundwater are influenced by precipitation as well as how much water is extracted for municipal use. Groundwater also plays a large role in lake surface level fluctuations as it can act as either a sink or a source depending on the current surficial and confined aquifer levels. The City actively monitors several surficial aquifer wells in accordance with the Southwest Florida Water Management District to determine the impacts from municipal water extraction. Future management goals of the Natural Resources Division involve the installation of Upper Floridan Aquifer (confined aquifer) monitoring wells to better track groundwater levels as well as water conservation measures such as installing rain gardens and other forms of “green” infrastructure. The Southwest Florida Water Management District must ensure enough water flows through the Peace River each year. To do this, it has mandated a minimum flow & level (MFL) for each section of the Peace River. Monitoring the seasonal changes in the flow of the Peace Creek can allow the City to determine when water can be held in our lakes and reservoirs for long-term storage and when it should be released to meet MFLs. In some cases, storing even a fraction of the water that flows downstream in a year could have monumental benefits to the municipal water supply!